Zurich had long been on my list of European destinations to visit, but it was by no means up there at the top. A chance pint with a fellow worker at a hotel in Slough – “I’m Daniel, from Zurich,” – opened up a conversation which served to whet my appetite a little more, and it was on my return from Russia in March of 2007 that I actively decided to make it my next trip. I chose once again to book it through BA. Adding the shuttle at either end of a flight from Manchester can admittedly be a bit of a ball ache (British Airways have yet to realise that we northerners also want to travel to out of the ordinary destinations, be it for work or pleasure), but connections weren’t too bad and, yet again, the trip came in well under budget including yet another amazing hotel. The Senator Hotel was actually situated on the outskirts of this beautiful city, more in the modern quarter, but Zurich’s excellent tram system means that for around four quid you can travel pretty much anywhere, door to door, for twenty-four hours. Well, at least until the last tram goes to bed. The old town has a baroque character all of its own, and sprawls at leisure either side of the River Limmat, twisting and turning up quaint avenues and alleyways. The promenade, which runs parallel with the river itself, plays host to an eclectic collection of bars and restaurants which cater for even the most discerning palate. There seems to be a notion among those who’ve never experienced the delights of the Swiss capital that it will be expensive; perhaps it’s because of its obvious financial connections. In fact, I was pleasantly surprised, with food and drink coming in at prices comparable to, if not a touch below, Spain and Greece. 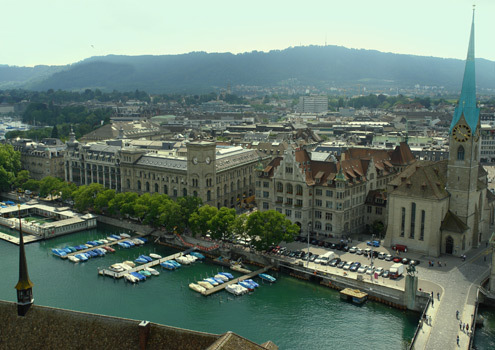 I realised I was thoroughly enjoying my stay as the week wore on, but I have to say that Zurich emerged – and has remained – as one of the destinations I would most want to go back to. It’s clean, friendly, beautiful, charming and easy – in fact, I can’t really fault it. I’ve covered elements here in more detail, but I really hope this simple overview whets your appetite as much as it should; if you dismiss Zurich for a romantic city break, a pleasant few days away, or even a summer holiday with a difference, you risk missing out on a wonderful soujourn into one of western Europe’s most elegant and beguiling cities. There seems to be a notion among those who’ve never experienced the delights of this Swiss city that it will be expensive; perhaps it’s because of its obvious financial connections. In fact, I was pleasantly surprised, with food and drink coming in at prices comparable to, if not a touch below, Spain and Greece.